4.3L 4266CC 260Cu. S430, S500, S600, S55 AMG From 2000-2002. Engine Make Model Trim Year. Color Orion Gray. It is Grey Color. It is the center trim cover. 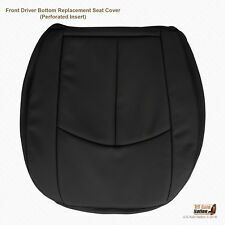 This Cover Can Be Used For Either Passenger or Driver Side Seats. 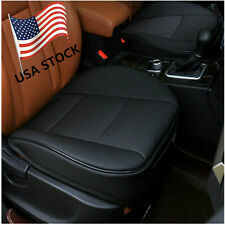 Leather Seat Covers vs Vinyl Vinyl is much more prone to cracks than leather. In the cold, vinyl gets hard and stiff. Leather stays soft and supple. Leather is very strong and durable, lasting Many years. It is Orion Gray Color. 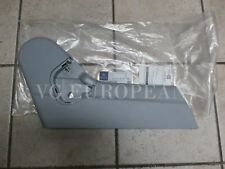 It is the corner trim cover. 4.3L 4266CC 260Cu. S430, S500, S600, S55 AMG From 2000-2002. Color JAVA. Engine Make Model Trim Year. 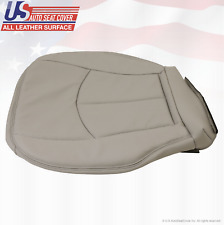 A wide variety of styles of seat covers are available for Mercedes-Benz vehicles, including leather, cloth, camouflage, sheepskin, towel, and pet designs. 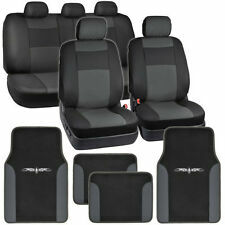 Accessories including cushions, headrest covers, and seatbelt covers are also available to suit different styles. 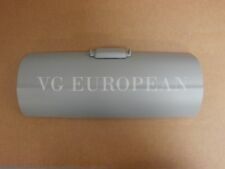 What types of overlays are there for Mercedes-Benz vehicles? 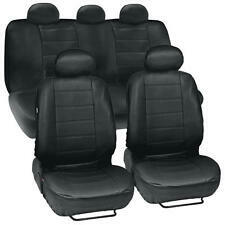 Mercedes Benz leather seat covers provide seats with a sleek look. They come in a variety of different colors, which include neutral tones as well as bright hues. 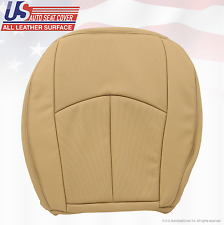 Some seat covers are two-toned with varying shades around the outside and in the middle. 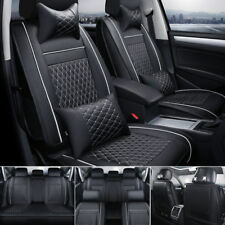 The leather seat covers are made for all types of Mercedes Benz seats; some accommodate headrests while others do not. Cloth overlays for Mercedes Benz vehicles are made from different textiles such as synthetic blends, neoprene, mesh, and custom blends. Cloth overlays are also available in various colors or prints, including patterns such as florals, animals, and geometric shapes, as well as solid colors. What are some qualities of camouflage and sheepskin overlays? Camouflage seat covers for Mercedes Benz are available in a variety of different textiles. Some are suede, leather, or cloth while others are made from carpet or terry cloth materials. Camouflage patterns also vary widely in scale and colors. Sheepskin seat overlays take on many forms. Luxury fleece, real sheepskin, and other similar textiles are available to cover armrests, seat trims, or the entire chair. This material comes in multiple colors, including black, ivory, grey, and other neutrals. This material, known for its plush softness, adds comfort and richness to seats. What are towel seat covers? Towel designs for Mercedes Benz seat covers consist of a large towel or a slightly thinner, more durable material than a bath towel, which covers the back and front of a car seat. Towels can also come with different logos printed on them, including sports teams, military branches, and other groups and hobbies. How do pet designs work? Mercedes Benz pet designs cover rear chairs so that pet fur and saliva does not affect the seats. The covers fasten to the rear bench with a series of buckles and straps, so that they do not come off if your pet moves around. The pet designs are also made from durable textiles that are water resistant or waterproof. Most can be removed and cleaned easily. 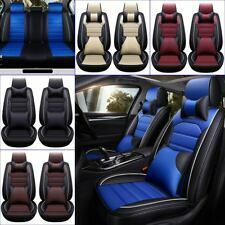 What bucket seat cover accessories are available? 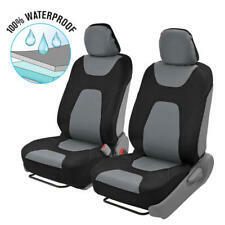 Cushions are available to cover the entire bucket seat or just the lower half. 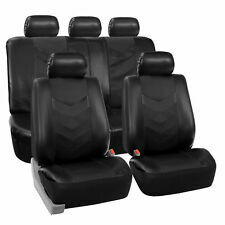 They are made from different combinations of gel, foam, and plastic to add contouring and support to the driver and front passenger bucket seats. 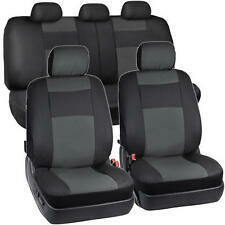 Headrest overlays are straightforward; some are cushioned, and some are just material that surrounds the headrest. These come in lots of different colors, textures, materials, and designs. 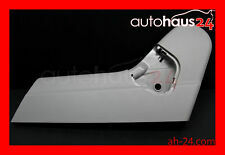 Additionally, logos and icons are commonly used for adorning headrests. Seatbelt overlays are foam tubes that use Velcro around seatbelts to keep sharp edges from cutting into drivers and passengers. These also come in different colors, styles, and designs.